The turn of the century was an interesting time for cyclists. Through the 1890s, enthusiasts had got used to studying the latest editions of Cycling magazine – or, even better, visiting the Stanley Show in London – to see the latest inventions applied to bicycles. After the introduction of the freewheel in 1898, new innovations increased dramatically. For the first time, bicycles started to develop practical braking systems and, within a few years, effective gears. In the 1890s, the front plunger brake, acting on the front tyre, had been the only common brake. 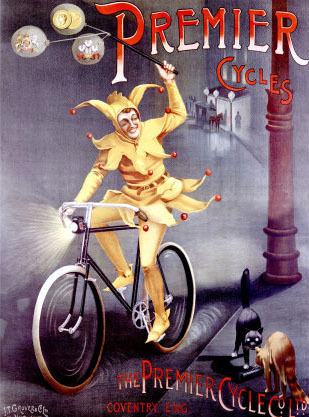 By 1903, bicycles started to be fitted for the first time with inverted levers under the handlebar grips, connected by rod or cable to rim brakes. But 1900 brakes were a curious mixture of the two styles. As you can see on this machine, the pull-up brake lever and rod are of the old plunger style, but instead of acting directly onto the tyre, it is connected to a horseshoe fitted with rubbers to act on the rim. Of course, this subsequently became a standard fitting, but in 1900 it was a novelty. Uniquely in that year, because it was connected to a pull-up brake rod, the horseshoe is supported only loosely by clips to the forks, so they can move upwards as the brake is activated. Above is an illustration of the early pattern Morrow Coaster, as used by Eadie in England and fitted to this machine. It fits to the chain stay on the right side of the bicycle, whereas the later Morrow Coasters fitted on the left side (below). Eadie used a different fitting to the rear stay.